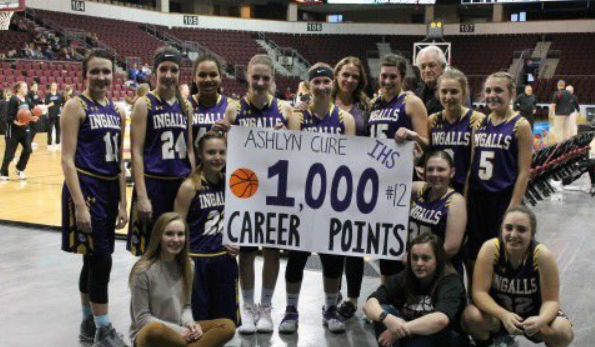 Ashlyn Cure went over 1,000 career points for Ingalls. Last week marked the majority of the state’s midseason tournaments, one of the busiest weeks in high school basketball. Some of the tournaments had multiple schedule changes because of weather, including one tournament that finished Monday. In a unique moment, the Haysville Campus boys, one of the state’s biggest turnarounds this season, defeated Wichita Trinity, 57-39, and captured the Bluestem Classic for the first time since 1980. The game was originally cancelled because of weather, but then made up Monday in El Dorado. Trinity entered the contest undefeated, while Campus has just one loss. Sophomore Sterling Chapman paced the Colts and earned MVP honors with 25 points. Campus is 10-1 and is ranked seventh in Class 6A, and Trinity is third in 4A behind KC Piper and Bishop Miege. The Liberal girls again captured the Salina Invitational, bumped to 11-0 and stayed No. 5 in Class 6A. Liberal defeated Salina Central, 59-48 in the championship. Liberal junior guard Katie Horyna repeated as the tournament’s Most Valuable Player, and Salina South’s Victoria Maxton collected Most Inspirational Player. Four players tallied double figures in the championship. Horyna had 15 points with six assists, Machia Mullens tallied 12 and three blocks, Whitney Hay had 11 and Audrey Gilmore also delivered 11. Liberal went 8 of 12 from 3-point range. Andover girls, which upset previously undefeated and ranked Abilene in the first round, eventually took third with a 55-43 win versus Salina South. Shawnee Mission East boys defeated host McPherson, 52-48, in the 55th annual McPherson Invitational. SME is ranked No. 8 in Class 6A. Derby girls, ranked No. 1 in Class 6A at 8-0, play in the Emporia tournament this week. Its Division I best friend tandem of point guard Tor’e Alford (Missouri State) and post Kennedy Brown (Oregon State) were each recently nominated for the McDonald’s All American game. Washburn Rural, under Kevin Muff, have been very impressive this season. They improved to 11-0 over the weekend as they knocked off KC Piper 61-52 in the Bobcat Invitational at Basehor Linwood. The most impressive thing is they were down 19 at the half. Muff has transitioned nicely back into the high school game after several years at Cloud County and most recently Pittsburg State as the head man. Bishop Carroll boys, the defending Class 5A state champions, have had a wild season. The Golden Eagles were preseason ranked No. 1 and then dropped out of the poll after two early December losses to Wichita Southeast by one point and at Wichita East, 75-63. However, since January, Carroll, led by a highly efficient offense and incredibly low turnover rate, have enjoyed a great month. On Jan. 4, the Golden Eagles won at rival Kapaun, 52-50, on a last second shot. On Jan. 8, Carroll won at Wichita Heights, then undefeated and ranked No. 1 in Class 5A, 61-46. Carroll lost at Maize on Jan. 11, 56-52. Maize is currently top-ranked in 5A. After the Golden Eagles won at Wichita North, 51-30, the Golden Eagles captured the prestigious Dodge City Tournament of Champions for the first time in school history last weekend. Carroll, 10-3, moved back into the 5A rankings this week at No. 10. In the first round, Carroll held off Newton and Division I recruit Ty Berry, 73-57. Berry had 24 points, eight rebounds, five assists and five turnovers. Carroll’s Carson Pracht had 23 points on 6 of 8 shooting, 3 of 3 from the free throw line and 8 of 8 from the free throw line, along with six assists. Carroll shot 56 percent from the field. In the semifinals, Carroll defeated Shawnee Mission South, 67-56, and outscored the Raiders, 28-15, in the fourth quarter. SMS was ranked No. 9 in Class 6A. Four players tallied between 10 and 13 points, led by Pracht. Carroll shot 55 percent from the field. Carroll had 11 turnovers, and SMS had twice as many. For the tournament, Carroll had 17 fewer turnovers than its opponents. In the final, Carroll defeated Junction City, 64-54. Carroll had eight treys, five more than Junction City, and shot 58 percent from the field. Pracht had 12 points and five assists, but Carson Lee, in just 14 minutes, 13 seconds of playing time off the bench, went 4 of 5 from 3-point range for 14 points. In the third quarter, BC outscored Junction City, 19-7. For the boys’ bracket in the Salina Invitational, Salina Central defeated Andover, 57-43, in the title. Salina Central bumped from nine in 5A to seventh. Salina Central senior Mark Grammer earned MVP, and Salina Salina senior Conner Munsell was the Most Inspirational Player. Maize South has won seven straight after a 1-3 start and beat Wichita Heights, 66-50, in the final of the Valley Center tournament. Maize South moved into the rankings at No. 9, while Heights dropped all the way to fifth. Kael Kordonowy collected tournament MVP honors. Hays High girls defeated host Colby, 50-19, to win the Orange and Black title. It marked the second time HHS had beaten the Eagles this winter, though the first one came down to the final seconds when Colby made a big comeback. Hays High (7-3) set a tournament finals record for fewest points allowed. Colby dropped to 8-4. HHS coach Alex Hutchins earned the Tom Bowen Coach’s Award. Kallie Leiker collected all-academic team, and Savannah Schneider and Brooke Denning each made the all-tournament team. The Ark City boys won its third straight Chaparral Road Runner tournament with a 79-50 victory against Clearwater. AC is ranked fourth in Class 5A. Aquinas girls picked up a tournament championship 50-36 over LIberty at the Trunam invite over the weekend. Kim Whetstone of Bonner Springs had 31 points and 22 boards in a game last week, no that is not a misprint. Andale boys won the Halstead tournament for the fifth straight season. Andale led Cheney, 14-0, after the first quarter and 30-9 at halftime. Easton Hunter collected tournament Most Outstanding Player honors with 8 of 10 shooting for 20 points. Andale is ranked fourth in Class 4A. Wichita Trinity (11-1) and Andale (10-1) lead the west side of Class 4A. Drew Ellis of Mulvane broke a 63-year old scoring record for points in a career as he went over 1,219 points for the Wildcats. Ellis was also a all-state WR in football this fall. Class 4A boys has zero undefeated teams. Chapman stands at 10-2 on the west. On the east, Independence leads at 10-2, while KC Piper is 11-3. Piper is No. 1, Miege is No. 2, and Trinity, Andale and Independence stand 3-5. Parsons is sixth with a 60-44 win against Independence. Parsons collected a key overtime victory, 62-55, against Baxter Springs last Friday. The Vikings have captured four straight victories. Baxter Springs is No. 10 in Class 3A. On the girls’ side, KC Piper is 12-0 and Miege is 7-0. Miege is at the Newton tournament this weekend. Baldwin stands at 8-1, and Labette County is 11-2. LC has allowed just 33 points a game this season, second-fewest in 4A East to Piper (29 ppa). On the west side, Nickerson is 10-0, Abilene is 10-1, while Ulysses is 8-1 and Rose Hill is 9-2. Ulysses is at the McPherson tournament this week. The Haven tournament has a stacked girls’ field that includes ranked teams Cheney, Nickerson, Haven and Rose Hill. Parsons boys and girls both captured the Lancer Classic Tournament Title, both over Baxter Springs. It marked the first title in 27 years at the Tournament for the girls. Nena Taylor has played like one of the best players in Kansas this season with seven games over 30 points. The boys won 62-55 in Overtime over a very solid Baxter Springs team. Daquan Johnson led the way with 23 points. Johnson is one of the states top multiple sport athletes and just a junior. Corbett Kimberlin went over 1,000 career points over the weekend for the CHanute boys. Two weeks ago, Norton was unranked in Class 3A. Last week, the Bluejays were No. 10. This week, Norton is up to seventh after a run to the Mid-Continent League girls’ basketball title. In the semifinals, Norton beat TMP in a game that had a running clock, 59-29. It marked the first time the Monarch girls (8-4) had lost a league tournament game since it joined the MCL. In the finals, Norton defeated top-seeded and host WaKeeney-Trego Community, 53-50, in overtime. Norton has not lost to a Kansas team this season and stand at 11-1. Norton was 13-10 last season and has made some big improvements, both collectively and individually. Last season, the Bluejays made 39 treys and shot 25 percent from beyond the arc. This season, Norton has already sunk 42 treys and is shooting 32 percent from long range. Norton has significantly improved its turnover rate. Last year, Norton turned the ball over on 30.2 percent of possessions. This year, it’s down to 22.4. The improvements have allowed the offense to jump from .71 points per possession to .93 this winter. The defense is slightly better, from .67 to .63 points allowed per possession. Individually, senior Taryn Kuhn averages 16 points a game, while sophomore Tessa Hauser has 10.7 ppg and senior Hadley Hauser has 10.1. Last year, the trio combined for 22.1 points per contest. On the boys’ side, Phillipsburg was the clear favorite. The 10-2 Panthers vaulted from ninth to fifth in Class 3A this week after they won their third straight league tournament title with a 60-46 victory versus TMP. Austin Miller, the Panthers’ 6-3 post, earned team player of the game honors with 18 points on 8 of 10 shooting. TMP is known for its post play and Miller helped the Panthers lead 19-6 after the first quarter. Senior Trey Sides collected 22 points with eight rebounds, three assists and three steals. Jared Mayers, the Monarchs’ 6-7 post, had 16 points, including a big dunk. TMP girls took third and moved to 8-4 with a 45-39 third-place win versus Smith Center on Saturday. For the boys’ Plainville, defeated Hill City, 65-56, for third place. Girard boys continued to look solid and are undefeated and ranked #1 in the state after capturing the Wilson County Classic Tournament title 57-33 over Yates Center this past weekend. Caleb Muia is one of the high flyers in Kansas this season and is averaging around 24 points per game. They have a huge matchup Tuesday against Baxter Springs, who lost to Parsons in the Lancer Classic Final. Baxter features senior guard Trey White, who is one of the best players in 3A. Other key players to watch for tonight are Kyler Reece of Baxter and Evan Troike of Girard. Alan Hibler, second year HC of Baxter, has over 500 career wins as a coach in Oklahoma and Kansas. Dylan Byrne has been a very impressive player for Silver Lake this season and had 38 points against McLouth over the weekend. Sterling girls and Beloit boys both picked up Sterling Invitational Tournament Championships over the weekend. John Long continues his big season for Santa Fe Trail as he has them with a 11-0 record as they captured the title of the Panther Classic at Royal Valley over the weekend. Long is averaging close to 30 points per game. St. Mary’s-Colgan girls won the Tony Dubray Classic and improved to 9-2. Cathy Farmer earned MVP honors after Colgan defeated rival Galena, 41-30, in the title. The boys also picked up tournament title over Galena, led by senior Aaron Higginbotham, named MVP. Meade girls moved to 10-2 and won the Hi-Plains League title with a 61-51 victory against Cimarron. Meade has captured six straight wins. The Hoxie boys captured the Northwest Kansas League tournament with a 68-62 victory against Wallace County-Sharon Springs. In the semifinals, Hoxie defeated Dighton, 58-41. The Indians are 11-1 and have only lost at Colby, 57-42, on Dec. 18. Hoxie is ranked third in 2A behind Inman and Colgan. Central Plains boys, ranked No. 1 in Class 1A, rolled over Wichita Sunrise Christian Academy, 58-35, and won the 51st annual St. John Mid-Winter Classic finale. Brett Liebl collected tournament MVP honors, and Devin Ryan was also named to the all-tournament team. In the semifinals, CP held off rival St. John, 42-31, the second time this season the Oilers have defeated the Tigers. In the third-place game, St. John beat league foe Ness City for the second time with a 57-54 victory. John Pfannenstiel finished with 19 points for the Eagles, and Tanner Halling had 15 points for the Tigers. Ness City, which also had 18 points from Landon Reinhardt, led 52-51, but Cashe McVey and Marshall Woolf (19 points) tallied back-to-back baskets. St. John was ranked fourth in 1A, and Ness City was third in 2A, but this week, SJ is fifth and Ness City is seventh. At the Centre Cougar Classic final, Rural Vista girls defeated Herington, 80-53, and moved to 12-0. RV moved up a spot from sixth to fifth. Berean boys collected the Burrton tournament, and Kiegan Vogt was named MVP. Berean was ninth in 1A last week and is eighth this week. Berean beat Inman, which is ranked No. 1 in 2A, in the final. Berean won 31-26 and gave Inman it first loss of the year. The game was 18 all at halftime, and Berean led 22-20 in the third quarter. Payton Froese paced 12-1 Inman with 10 points. The all-tournament team featured Goessel’s Dylan Lindeman, Little River’s Jayden Garrison, Vogt, Froese, Inman’s Mason Thiessen, Burrton’s Cooper Zehr, Christin Christian’s Adam Hall, Little River’s Graham Stephens, Berean’s Chase Wiebe and Goessel’s Drew Lindeman. Central Christian’s Caleb Lambert earned tournament’s Most Inspirational Player honors. At Hoisington, Pratt girls gave Otis-Bison its first loss with a 51-28 victory in the final. O-B was ranked ninth in 1A. On the boys’ side, Victoria boys have enjoyed a big turnaround after a winless December. Victoria beat host Hoisington, 55-53, to win the Hoisington tournament. In a high-profile league tournament, Frankfort girls won the Twin Valley League title. In the semifinals, Emilee Ebert hit a last-second shot to defeat Centralia, 52-51, and then beat Hanover, 45-44. Ebert and Kennen Brandt collected all-tournament team honors. Last week, Frankfort was seventh in 1A, Centralia stood fourth and Hanover fifth. This week, Frankfort is up to fourth, Hanover is sixth and Centralia seventh. Osborne boys won the Northern Plains League title against Beloit/St. John’s-Tipton, 52-42, and moved to 12-0. Thunder Ridge earned the NPL girls’ title for the sixth straight year with a 47-26 win against Osborne. TR remains unranked in 1A. However, in the quarterfinals, the No. 4-seeded Longhorns defeated the top-ranked and undefeated Beloit/St. John’s-Tipton girls, 48-28. BSJT was ranked eighth in the poll and dropped out this week. Osborne girls made a nice run as the No. 6 seed with upset wins versus No. 3 Southern Cloud (44-41) and No. 2 Sylvan-Lucas (44-42). Ingalls’ Ashlyn Cure scored 21 points in the first round of the Southern Plains Iroquois tournament that started Monday at Dodge City. Cure been a significant player all four years for the Bulldogs. As a freshman, she helped Ingalls take third at state at Dodge City in Class 1A, Division II. Ashlyn cleared 1,000 career points. She is also a 4.0 student and standout in cross country and track. Ingalls fell to Bucklin, 41-39. Cure put Ingalls in front 39-38 with 67 seconds left, but Bucklin standout Tricia Hokanson sunk a 3 with around 45 seconds remaining for the winning margin. Cure was 8 of 9 from the free throw line. Sophomore Catherine Bowman paced Bucklin with 12 points, and Hokanson delivered nine. Also in the SPIAA tournament, Kiowa County girls pulled a big upset in the first round with a victory against No. 1 seed Spearville. The Lancers entered the tournament undefeated and ranked third in Class 1A. KC, a 20-win program last winter, are the No. 8 seed and had to beat No. 9 Minneola in a play-in game. The Mavericks earned a 57-55 victory. KC junior Sabrina Thomas scored 26 points. Kiowa County went to a box-and-one on Spearville sophomore Alissa Heskamp, who did tally 20 points. Spearville led by 10 late in the third quarter and had a 43-36 lead entering the fourth. Casey Erickson had a mammoth fourth quarter for the Mavericks with three 3s and two free throws. She had 14 points, and senior Brecken VandenHoek tallied 11. Kiowa County will play fourth-seeded South Gray on Thursday night. Burlingame’s Trevin Lewis has 16 dunks this year. Brayden Sadler continues dominating year as he is averaging 26.9 points per game and 7.9 boards per contest in 2018-2019. The junior of Udall has his team at a 9-4 record after a 6-15 mark in 2017-2018.